“Follow the gulls! They know where the good stuff is!” I shouted, sounding more like a conch-wielding character from Lord of the Flies than a six-months-pregnant mother of four (soon to be five) kids. Pacific Northwest beaches at low tide — salty air, driftwood, bulbous seaweed whips — never fail to transport me back to childhood. And, after a 75-minute drive from Seattle, over the Narrows Bridge near the town of Allyn at North Bay, we were too excited to wait for Langdon Cook, author of Fat of the Land: Adventures of a 21st Century Forager and our beach guide for the day with the know-how to teach us how to forage for clams “hunter-gatherer, clean-and-cook-your-catch-beachside” style. As a parent, these experiences in the wild with my children around the Pacific Northwest are what I crave — they are delicious bites of local adventures that inspire curiosity and wonder for both child and parent. How would you define what you do in regards to foraging? I think of myself as a recreational forager. It’s something I’ve been doing for the past 20 years, and at a certain point I realized I had stories to tell from my adventures in both field and kitchen. How do you think teaching kids about foraging encourages future generations an appreciation and understanding of the connection between getting out into nature and conservation? I’m all about getting kids outside. Today’s children are tomorrow’s environmental stewards. But it’s hard to develop a deep connection to the natural world unless you spend some time outdoors. Foraging offers a purpose, a reason to trek through the woods or stand boot-deep in a muddy shellfish bed. The foraging itself has a fun, treasure-hunt quality — and the final meal is like a great exclamation mark on a day spent mucking around outside. Do you have any advice for parents interested in taking their kids out foraging? The first thing for parents to do is to simply get outside with their kids. Go to a park, a beach, the woods. It doesn’t need to be a big event. My interest started with visits to my grandparents in Florida. They took me to the Corkscrew Swamp and I was hooked. The next step is more organized outdoor time. Many mycological societies offer cheap family memberships and guided mushroom forays. Botanical and horticultural clubs can teach you about plants and backyard vegetable gardens. Hiking clubs are a great resource. I got into birdwatching as a kid. My parents would drop me off at the local Audubon for the annual hawk watch during fall migration. We send our own children off to a wilderness sleep-away camp for a few weeks in summer. My interest in foraging grew out of a general desire to be outside in nature. There’s no better sandbox. Tide talk. 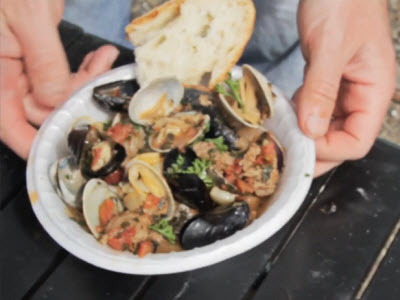 Consult the Washington Department of Fish and Wildlife website to determine safe and best times to forage for clams. Get your license. Before hitting the beach, you must acquire a clamming license through the Washington Department of Fish and Wildlife or retail outlets such as Big 5. Dress appropriately. 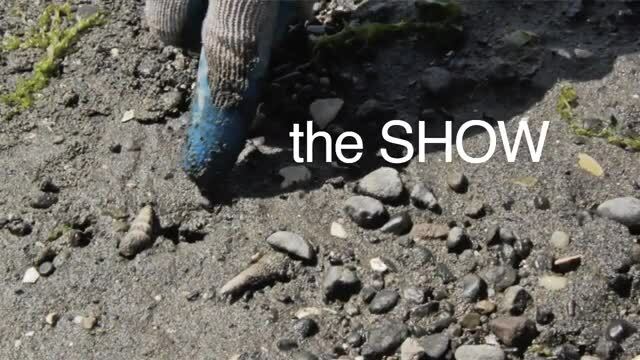 Clamming clothing should be comfortable and washable. And, remember, in the Pacific Northwest, if you wait ten minutes, the weather changes… so be prepared. Tools of the trade. 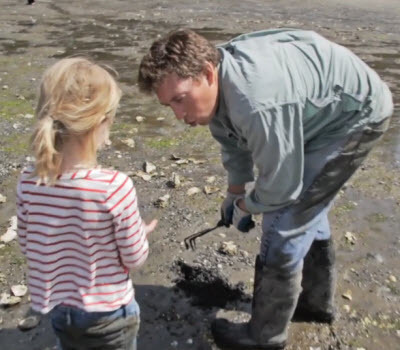 When clamming with kids, bring sand buckets and garden claw/scratchers. Learn more. 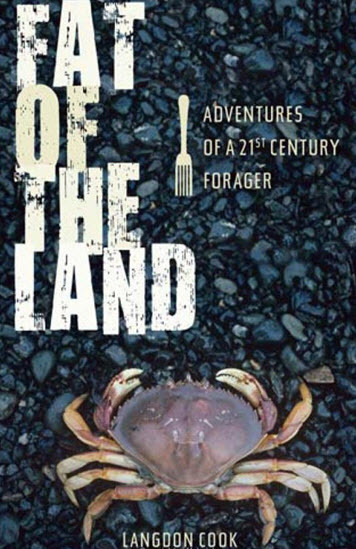 Visit Langdon Cook’s blog for a wealth of fantastic information about clamming, other types of foraging and amazing recipes. Heat olive oil in deep sauté pan or heavy-bottomed pot and brown sausage. Add onions and garlic; cook until soft. De-glaze with white wine, making sure to scrape and incorporate all the brown bits from the pan. Mix in can of tomatoes with juice, chopped herbs and pepper flakes. Cook for a few minutes over medium heat. Raise heat to high, dump in shellfish, and cover. Steam until shells open, several minutes. Serve in bowls with toasted bread. Makes two dinner portions. Carolyn Ossorio writes about life in the city with her four children in her column for the Renton Reporter as well as regularly blogs for the Huffington Post about her love of cookin’ and trippin’ around the Pacific Northwest with her family. Forks in the Road is her family’s latest adventure — part cooking show, part field trip and 100% inspiring and relatable. 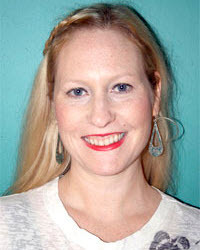 Find Carolyn at pippimamma.com or on Facebook.